I teach 10-16 year-olds and am very thankful to be a part of this wonderful community - a permanent source of inspiration. 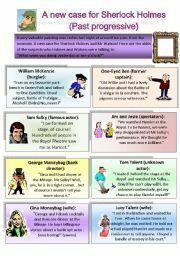 This is a set of eight funny situations (16 conversation cards) for intermediate students which can be used as a speaking activity at A2+ or B1 level. 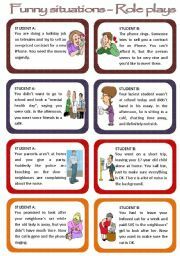 Students read the situations on their cards, develop the idea and then they role-play the situation. Editable. Have a wonderful weekend. Part 9 of my Sherlock Holmes series. A new detective story which asks students to find out who broke into a house. 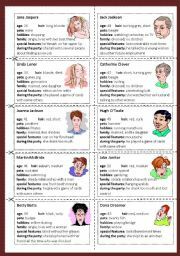 The students have to read the alibi cards carefully. 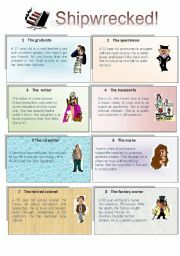 The ws combines reading and grammar (active and passive voice). Two different exercises on active/passive are included, and so is the KEY. Hope you like it. 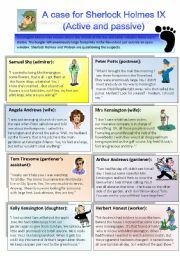 This is set 2 of further eight funny situations (16 conversation cards) for intermediate students which can be used as a speaking activity at A2+ or B1 level. 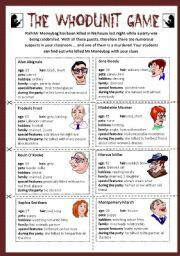 Students read the situations on their cards, develop the idea and then they role-play the situation. Editable. Have a wonderful Sunday! 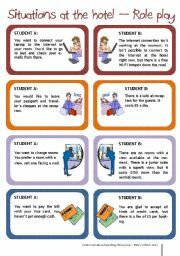 This is a set of four classic situations which provoke complaints at a hotel - one partner is the guest, the other the receptionist. It is aimed at intermediate students at A2+ or B1 level. 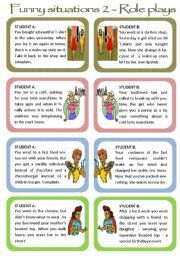 Students read the situations on their cards, develop the idea and then they role-play the situation. Editable. A gap-fill-in exercise on relative pronouns. Context: British and American history. Cliparts: Philip Martin. Key included. An exercise for my year 9-students (B1 level) to express preferences and advice. 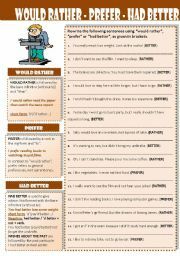 They use the stuctures "had better", "would rather" and "prefer" and transform the sentences, using the key word given. Key included. Originally I created this as a listening exercise, but the embedded wav.files made the ppt far too big. 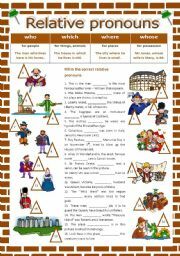 So I changed it into an elementary reading comprehension exercise. I used it on the open day and it worked well with beginners. Slide 1 can be used for revising the words. Cliparts: Philip Martin. A Power Point on the famous Rolling Stones song "Sympathy for the devil" which goes with my printable (http://www.eslprintables.com/printable.asp?id=531976#thetop). It includes 6 different exercises their solutions, a link to the video and a short follow-up role play. Hope you like it.